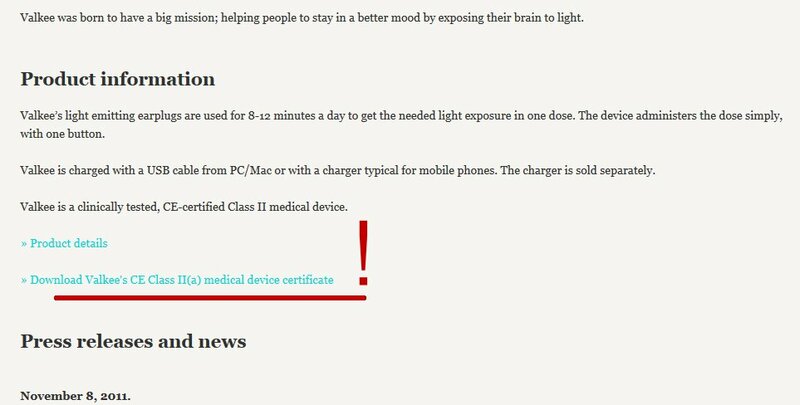 Valkee tells to potential victims the public that the earlight device heals Seasonal Affective Disorder (SAD), alleviates jet-lag and resets the internal clock, enhances cognitive performance, and betters motoric reaction. 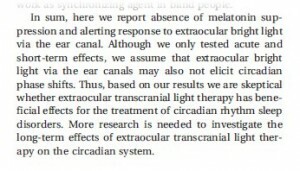 The SAD and circadian rythm claims have been defeated in placebo-controlled trials, as earlightswindle.com evidenced before. But what about the supposed positive effects on healthy people? The enhancement in performance test time for 11 persons exposed to Valkee’s earlight was moderate and of some heterogenity. 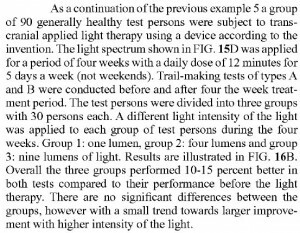 Valkee undertook a controlled study similar to (or part of) the failed SAD study: Three groups á 30 persons with 3 different light intensities ~1, 4 and 9 lumen. Treatment was to be applied over 4 weeks for 12min/day on weekdays. 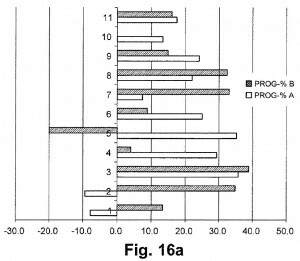 The result was the same as in the SAD trial: No difference between the groups. 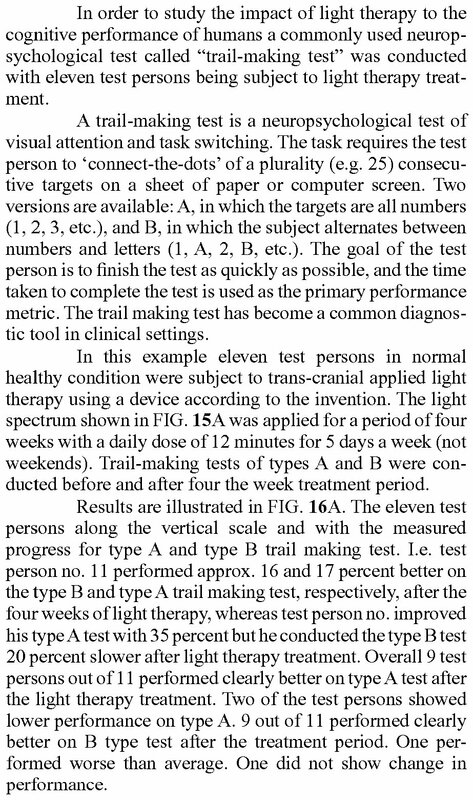 Valkee had done some dose-finding tests before, identifying the 1 lumen intensity as placebo (same source). 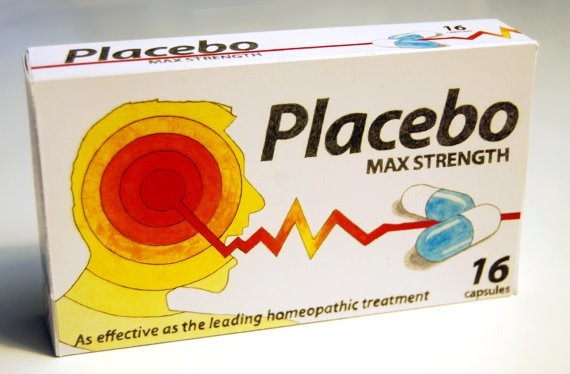 It is likely, that this 90 persons study was also designed and run as a placebo-controlled trial. In any case, it showed that it is irrelevant what to put in one’s ears, as long as you put something there at all. Valkee knew from this point, that earlight itself has no effect on a healthy person’s performance – but also that a trial would seemingly show an effect, if the test would not be properly controlled. 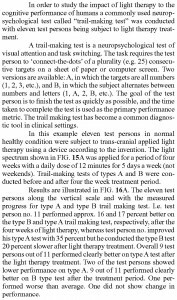 The company did then such a test with healthy students, with the “control group” getting no treatment at all, not even sham treatment (in biomedical research a so-called waiting list control). The result was as foreseen, and subsequently used for marketing. The former and methodically better study results were buried. That’s the way Valkee does research, signed with “University of Oulu”. Finnish tax payers’ money at work. 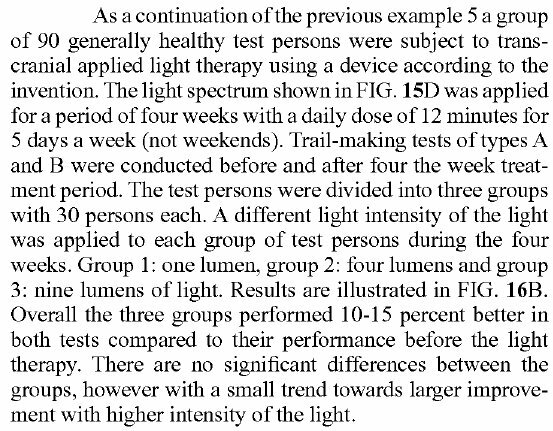 Update 4.1.2014: It may not have been a separate study, but conducted in connection with, or as a part of, the RCT in Seasonal Affective Disorder. This would mean Valkee calls persons with severe depression “generally healthy”, and silenced completely these outcomes when the RCT was registered. 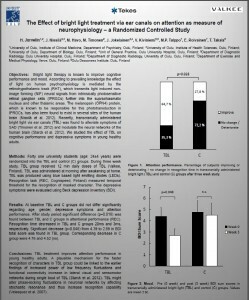 This would also mean that a placebo-controlled trial showed that the device does not better cognitive performance. None of Valkee’s studies has been published in a peer-reviewed journal. However, the company often claims that they are submitting articles to journals – but that it takes usually around 3 years until an earlight paper appears in obscure sources. One of the unpublished articles, which has been, according to Valkee, under review somewhere, is Valkee’s 2011 placebo-controlled study in Seasonal Affective Disorder. The company told repeatedly to have “published” this thing – instead, a forged abstract without details was listed in a congress supplement. Here is exclusively a full-text version of the buried article. 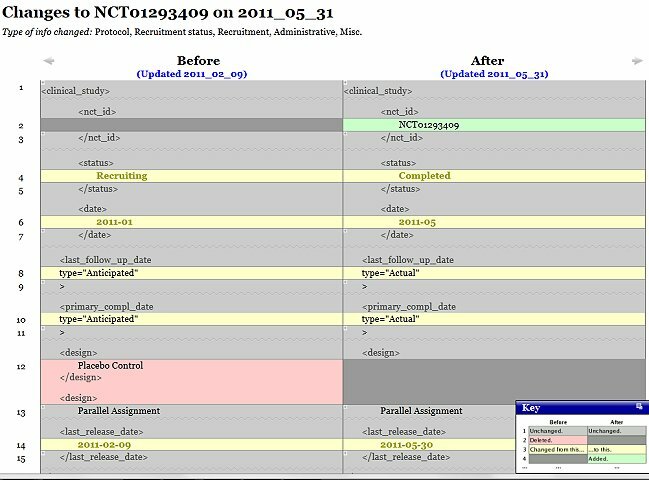 With all outcome details, but w/o abstract & references. 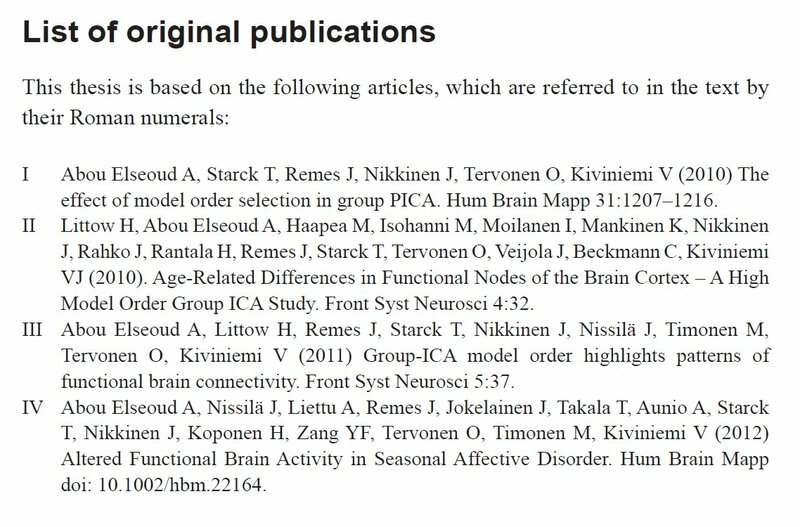 Note that the authors claim that there has been no placebo group. 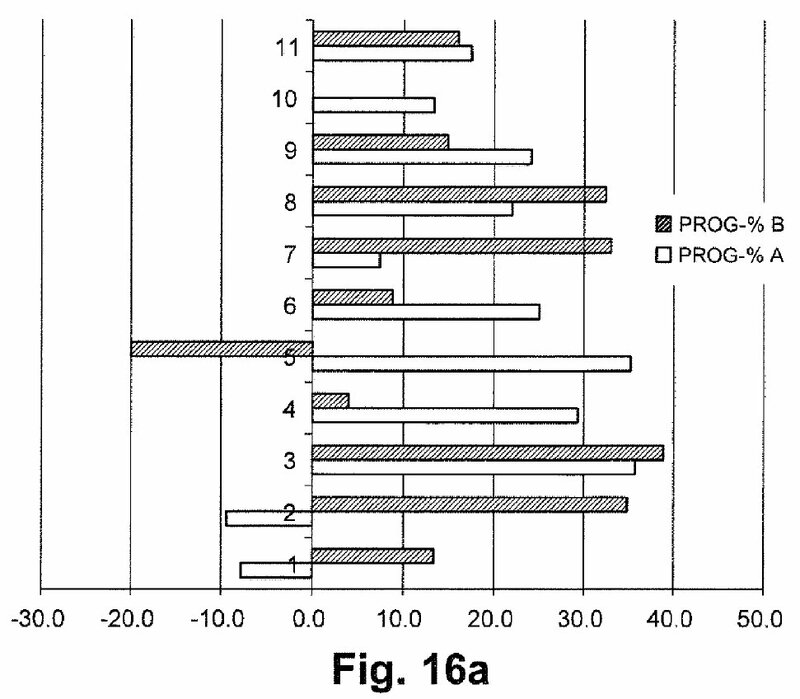 The study registration tells clearly that Valkee’s pseudoscientists are lying. 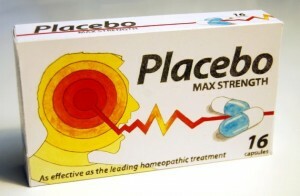 The placebo was erased and declared as active treatment after the study had failed. Such a faked study can not be published in a medical journal, any editor will note the fraud. On the other hand, the authors may have been lucky to have avoided publication: An economically motivated research fraud of this dimension could easily be a career-stopper. An article wouldn’t have gone unnoticed, as the abstract did. 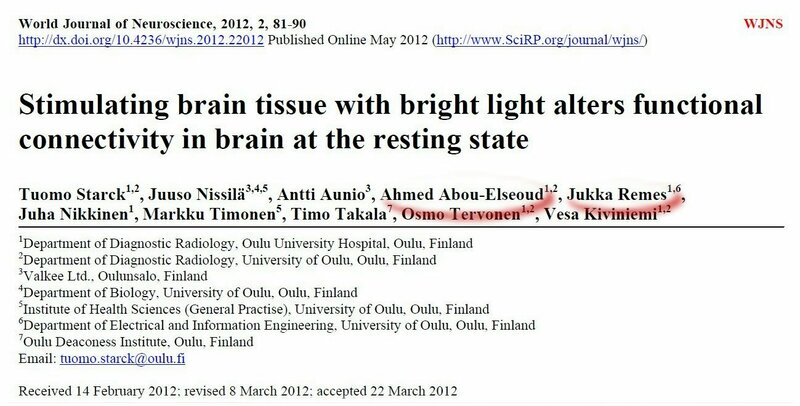 Both are not listing Valkee’s “revolutionary research” about the light-sensitive brain, although it would fit exactly: it was arguably done by them, in this time interval, and with the same team, on this topic. So, why it is not there? 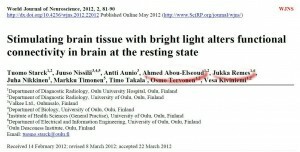 The answer comes in the Journal of the Finnish Medical Association. 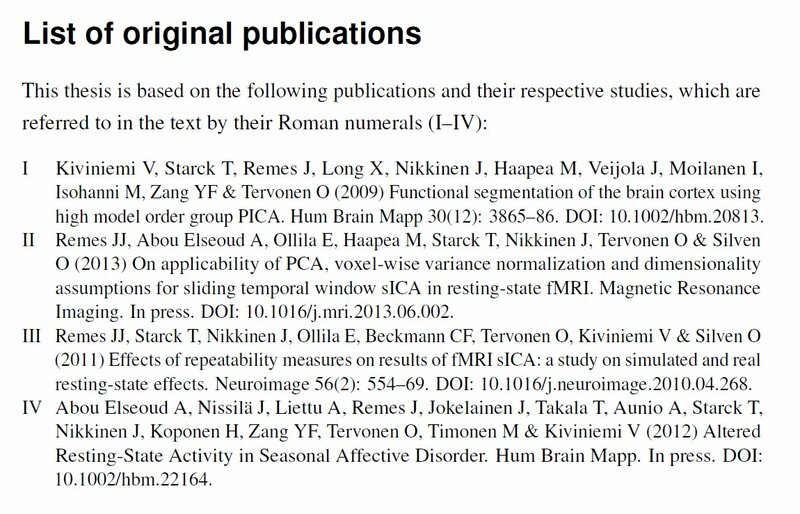 Junk publications are not accepted by Finnish Universities in a thesis. And that Valkee article is just such garbage. So far, nothing new. The point is that they know what they are doing, and what their “work” is worth. Even the University of Oulu, which did accept a Ph.D. thesis about dowsing as a measure for electromagnetic sensitivity,* even the University of Oulu does not accept Valkee’s junk. *after public outcry it was later re-checked and rejected spectacularly – otherwise, it would have gone through. The first-ever peer-reviewed scientific article about Valkee was published some 3 weeks ago. It was the first placebo-controlled study on Valkee reaching the public, and it was done by independent, well-known researchers. Therefore, it’s not surprising that the result was negative. Valkee’s scam device is useless. At this point, the swiss study was not “about to be published”, it was already published 6 days ago. But why not try to mislead those who cannot use PubMed? 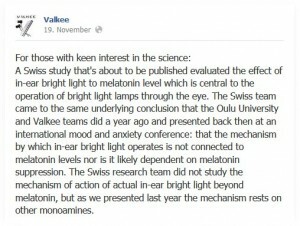 Valkee’s own earlight research never even came close to a scientific publication – i.e. it never passed independent peer-review. All those snippets link to a blog entry by Melanie Rüger, PhD, in Valkee’s pop-science blog Shine. It’s reproduced here, because their statements are often volatile. What Valkee is trying to sell tell on all channels: The Swiss had investigated something which is not related to the earlight’s function. The device does not influence Melatonin, because it’s not needed. All are looking on the Melatonin, but they’re all wrong. If they’d be experts, they’d know that Valkee had already told this – so nothing new here. The reality, however, is somewhat different from Valkee’s tales. If something works on the internal clock, then it can be checked through salivary melatonin levels. Such studies are usually conducted at the evening or at night, to allow for best signal detection. The melatonin secretion rises in the evening, peaks around 03.00 – 04.00, then falls. It is very low during the day, making it difficult to find changes then. 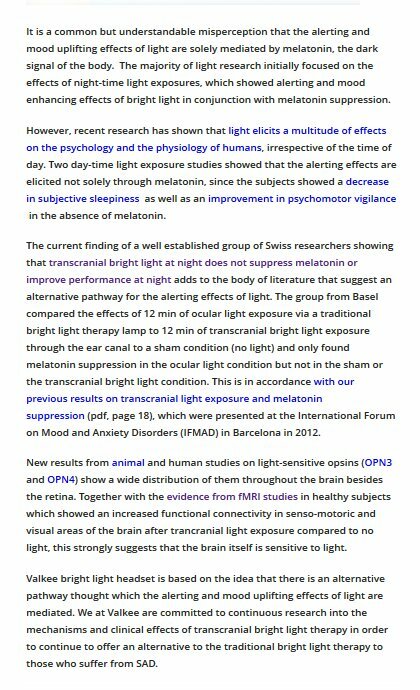 Light suppresses this melatonin level rise, and bright light applied in the evening makes alert. 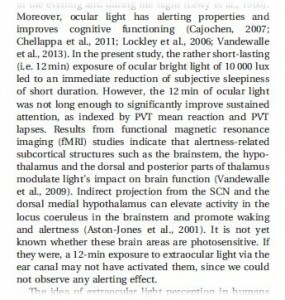 This was shown in the study for the active control condition, standard ocular bright light over 12 minutes. 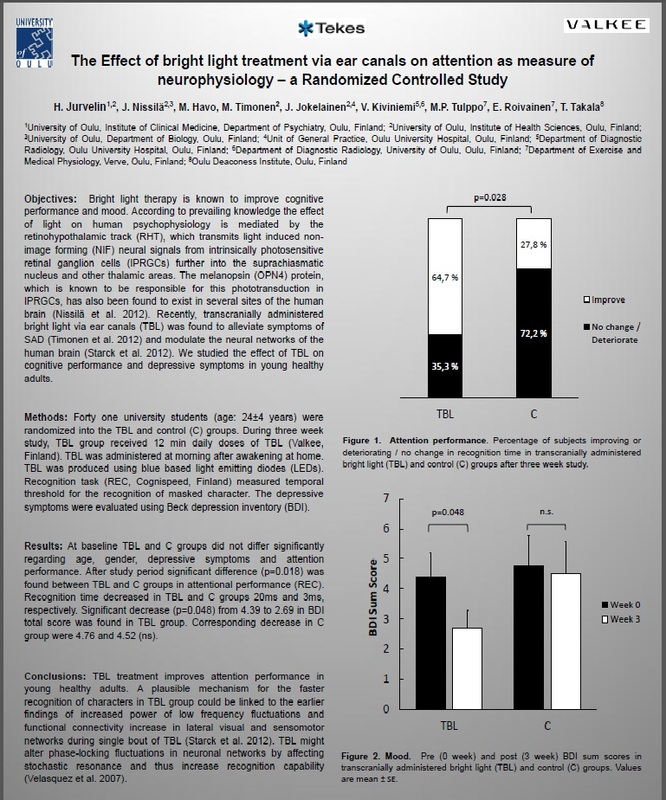 It clearly reduced sleepiness, although normal therapeutic exposition would be 30min or longer. Politely they add that longer-term effects were not studied. But how could chronic use have any effect, if there’s not even a short-term reaction to the light? This has grave consequences for Valkee. All known treatments for jet-lag are interfering with the body’s internal clock. Phase-shifting, clock-setting effects are needed to work against such symptoms and circadian sleep disorders in general. If something is supposed to work on the internal clock, then it has to work on the internal clock. And Valkee’s device doesn’t. Even if the company would be right with some of their marketing-driven speculations about alternative pathways – the output of the internal clock still says it is not affected by earlight. All embellished talk about feel-good monoamines is pointless, it misses the central question. A smoke screen. This result smashes in any case Valkee’s marketing speech of a “portable substitute for sunlight”. Light through the ears definitely has not the beneficial effects of real sunlight on the brain. Their earlight device has nothing to do with true bright light therapy, which works on the internal clock. Valkee’s use of bright light studies for marketing is absolutely inappropriate, at the very least. Valkee has every reason to silence the public discussion about these facts. The company tells further it had foreseen these results already in a 2012 IFMAD congress presentation. 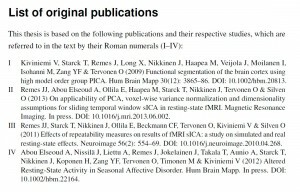 They link to a PDF (page 18) with poster titles and author names, but no information on what the research (?) allegedly showed and how it was done. Not only that there’s no scientific publication. 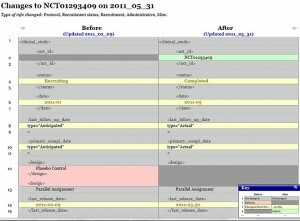 Not even the abstract can be found through database searches, and the content is inaccessible. It is virtually non-existing, in terms of science. To compare such a fictive thing to a real journal article is bad misinformation. Furthermore, the effect of bright light therapy on Seasonal Affective Disorder (SAD) is thought to be related to the internal clock. 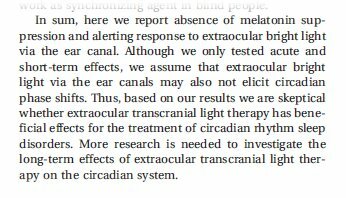 The swiss results are excellently in line with the findings from clinical trials demonstrating that earlight works, at best, like a placebo in SAD. 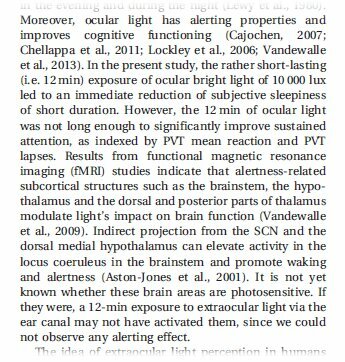 Earlight lacks an alerting effect which was demonstrated for bright light, and the study showed that it also has no effect on motoric reaction and attention. The short ocular exposure in the control group did have neither. It is not marketed as improving sport performance in healthy people. To make it short: Valkee is useless. And that is proven by clinical trials. There is no reason, whatever, to suspect that it could work. Are there any doubts, what Ms Rüger is being paid for by Valkee? Update 28.12.2013: Valkee is reading this blog carefully. 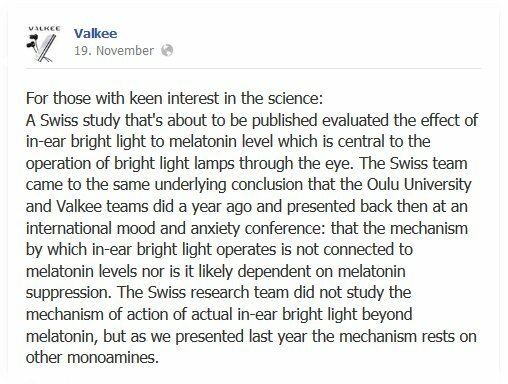 They’ve put now online the poster which allegedly told that Valkee’s earlight is working through some alternative pathway, not melatonin. Instead, the poster says only, that earlight does not suppress melatonin (=does not influence the internal clock). Valkee had known for at least a year, that their marketing claims about effects on circadian rhythms are baseless. 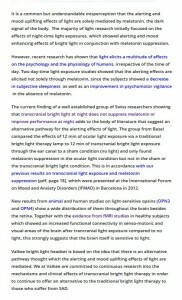 Valkee is telling us, that “Light elicits its effects through different mechanisms than melatonin alone” without knowing a single bit what these mechanisms are. Because it does not work, it works! Because it has to work! We are telling you that it does!! It is absolutely clear to me, why they hid this poster from the public. Incredible./-ed. On the IFMAD website, the 2012 and 2013 poster abstracts are available now. Noted that the article PDF is better linked here than in the previous post. 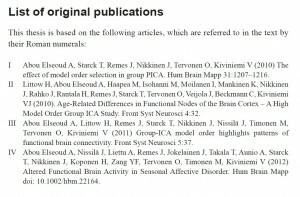 Full-text PDF of the Bromundt study.